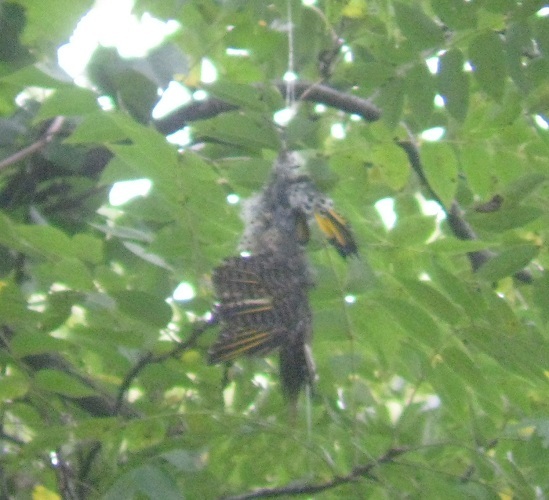 A Northern Flicker, dead and stuck on the line. I assume it flew into the line after the hawk brought the line into the tree, but that is just conjecture. I was shocked and saddened to find this second dead bird, and so I repeat my plea: "If you fish, make sure your line comes back with you." Please show this to interested friends, especially fishermen, so we can prevent some of these unnecessary deaths in the future. Finally, let me say that I can't be absolutely certain that this is fishing line...but it sure looked like it, and that seems to be the best explanation.